Yesterday’s cruise on the EScape out of Basin Harbor was a huge success. The day started with a forecast of high humidity, strong south wind and 65% chance of thunderstorms. Despite the forecast over twenty people turned out to take advantage of the boat and the scenery. 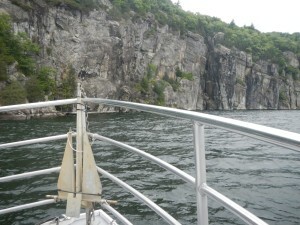 The air was warm and the views outstanding and despite a little splashing the boat was perfect for the day. We headed north to the Palisades and talked about the natural history of the lake and of the Split Rock Wild Forest. The lakeshore from Westport to Essex is the longest stretch of undeveloped land on the lake and the wilderness character is evident. The tall white pines and cliffs are home to bald eagles and falcons and ospreys. There are also beautiful shows of lichen on the rock faces. I love the small ledges that are like miniature wild gardens and the trees that have been “bonzai-ed” by the growing conditions on those narrow ledges. We crossed the lake, checking out Diamond Island and explored the Vermont shore and Otter Creek where there were hundreds of swallows, a fair number of cormorants and a very vocal osprey on a platform nest. Lots more to explore by smaller craft in the future. Thanks to Captain Alex, Marty Ferris and Dane the patient bartender on board. What a great trip this was! I thoroughly enjoyed myself and look forward to doing it again sometime. My next adventure will be a private kayak lesson with Elizabeth who is an awesome guide.